Update (07 Jan 2017): Happy New Year! This will be the last update in this post. The blockbuster year in Indian commemorative stamps has finally ended with the issuance of ten stamps on Legendary Singers of India and a MyStamp sheetlet on KCP Limited founder V. Ramakrishna. This MyStamp was the first one issued on a personality. Here's a brief analysis of the year gone by and some key points of note. - As you are all aware, 2016 was the year with maximum high denomination stamps, resulting in the highest cost to purchase one of each commemorative stamp; when compared with last 15 years. A total of 36 stamps higher than Rs 5 denomination (minimum postage rate) were issued. - Sheetlets were sold on ePostOffice for four stamp issues (Surya Namaskar, Rio Olympics, Orchids and Metal Crafts) with a high premium and were not made available at post offices. This was a first. - Customized MyStamps were issued for corporate customers and sold on ePostOffice for Rs 500. A total of 28 MyStamps sheetlets (including personalized and customized) were made available, resulting in higher than Rs 10,000 price for purchase of one of each sheetlet. Update (28 Dec 2016): India Post will issue the last two stamps for the year in the next couple days. First, a commemorative stamp on Deendayal Upadhyaya will be issued on 29th December to celebrate his birth centenary. This stamp as originally planned for dedication on 25th September, but was delayed for unknown reasons. The last release will be a set of 10 designs on Legendary Singers, on 30th December. There's a separate blog post on this stamp issue (link is below). Six out of these ten singers have already been commemorated on stamps earlier, same as Deendayal Upadhyaya. Two other stamps, one commemorative (1978) and definitive (2015), were earlier issued to celebrate the contribution on Deendayal Upadhyaya, the guiding light and an ideologue for a large section of India's socio-political class. 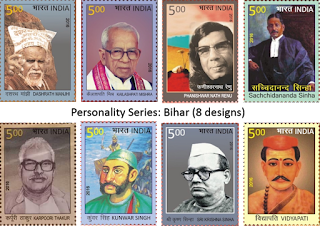 BetterPhilately is appreciative of the attempt to balance India's stamp programs with leaders of all hues and platforms. It is not clear if the dedication ceremony of the new stamp will be held in New Delhi or Upadhyaya's home state of Uttar Pradesh. Images of this new 10 Rupees stamp have been available on the internet since late September and can be seen below. Details for the Legendary Singers stamp issue will be shared on the other post on this blog. Next up will be a check on the total number of stamps issued and the cost for collecting Indian stamps in 2016, which appears to be significantly higher than previous 15 years. Update (26 Dec 2016): Stamps on Hardayal Public Library and Personalities of Bihar were issued today by MoS Anupriya Patel in New Delhi. These are among the many poorly designed stamps issued by India Post this year. The stamp on Hardayal Library actually shows the yellow and black traffic marking and pavement as well as outgrowth of grass. The 8 stamps on personalities also lack total genuineness. Typically each individual being commemorated would have contributed to the society and that contribution can easily be depicted along with the main image. These stamps are literally images thrown on sheets of gummed paper (look at the Dashrath Manjhi and Phanishwar Nath Renu stamps). Utter disgrace. 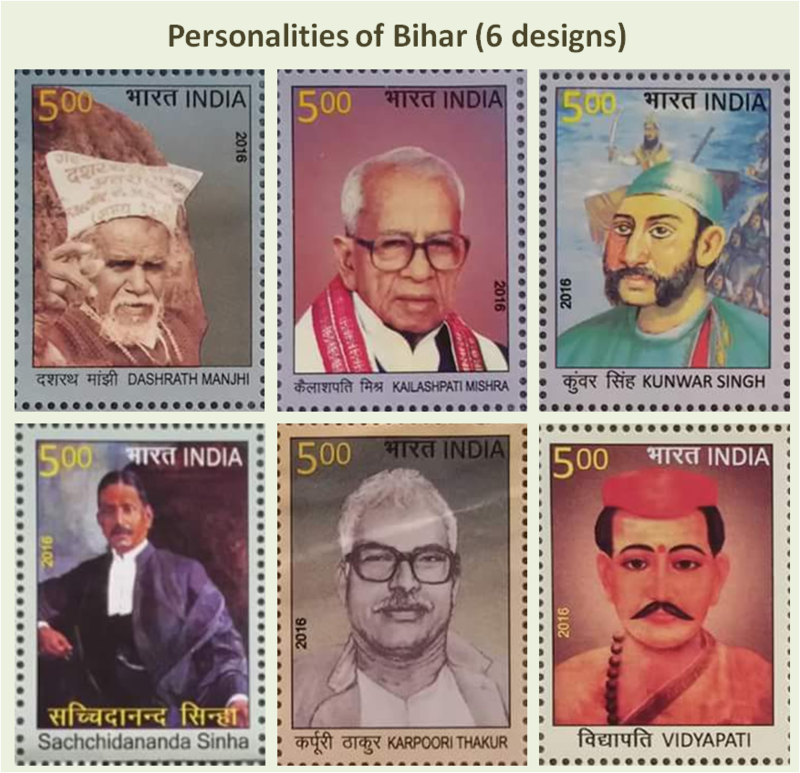 Four out of the 8 personalities from Bihar have already been on Indian postage stamps before. Six of these stamps were likely prematurely released by some post offices and we had shared images in September. It appears that Phanishwar Nath Renu and Sri Krishna Sinha were added to the series later. The four new personalities being commemorated with this series are commendable, but we don't see the logic behind issuing new stamps on the same people again. See the images from today's release below. - In a second update within the same day, India Post has decided to issue the Pride of Bihar and Hardayal Municipal Library stamps in December as well. This, we believe should complete a blockbuster year in collecting Indian stamps. - A stamp on Samrat Vikramaditya was issued on 22nd December by the Governor of Uttar Pradesh and MoS Communications in Lucknow. It shows an image of the king's statue in Ujjain, Madhya Pradesh. - India Post has decided to issue the set of 10 stamps on Legendary Singers of India on 30th Dec and the stamp on Deendayal Upadhyaya on 29th December. - This could be among the last few updates on stamp releases by India Post in 2016. Let's hope India Post is more organized in 2017 with better planning, better designs, better pricing, all leading to better philately for stamp collectors. - India-Papua New Guinea joint issue has been further delayed and now appears set to be released on 03rd April 2017 (according to PNG Post). - The stamp on Acharya Vimal Sagar was finally released on 14th Dec, by the MoS Communications, Manoj Sinha at Dak Bhawan in New Delhi. - No other stamp issue dates were made available by India Post over the last one week. There are at least two to three stamp issues that have been printed with the year 2016 on them, and we believe those should either be released or withdrawn and destroyed as opposed to being released in 2017. India Post should reprint the stamps if they are unreleased in the correct calendar year. It makes it difficult for stamp collectors to keep the collections organized when such delays happen and there is confusion all over (for e.g. stamps on NMR Subbaraman in 2006, Jayadeva and Geetagovina in 2009). Update (10 Dec 2016): The last few weeks of the year will be full of activity for stamp collectors, with so many pending issues that could be put out for sale in post offices. Four stamps have been released in December so far and nine more are planned. It's not quite clear how many of the pending issues will see light of the day, so we are pushing some of the stamp subjects into the ambiguous category. Some stamps that are already been printed have potential for release this year itself. In other news, a set of 6 stamps was issued on Exotic Birds on 05th December. Two miniature sheets (Rs 30 each) and two sheetlets (Rs 150 each) were released along with regular full sheets of 45 stamps each. All these items will be available for sale at post offices and at ePostOffice (most items). 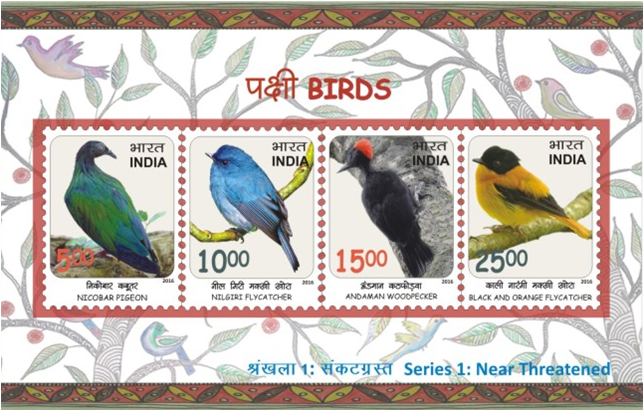 India Post has issued 10 stamps on birds in 2016 (could increase to 12 if the joint issue with Papua New Guinea is released), which appears to be a record in itself. A se-tenant of 2 stamps was released on Akshardham Temple and Pramukh Swami Maharaj on 07th December. We want to congratulate India Post to have finally selected a superb design for the stamps. See the image below. Update (03 Dec 2016): A much needed update was provided by India Post with issue dates for some stamp releases for December. The stamp on AIIMS, New Delhi was finally issued on 03rd December during the 44th graduation ceremony of the premier medical institute, which is celebrating it's 60 years of founding. Like it was previously predicted by BetterPhilately, the stamp on Pramukh Swami Ji will be released on 07th December, his birth anniversary. A couple other stamp issues appeared to have been included for issue in December - Coffee (fragrant stamp) and Seasons Greetings. India Post had indicated in September that new stamps with fragrance could be released and the one on Coffee appears to be a follow up on that topic. The last stamps on Seasons Greetings were issued in 2009. Including these two new stamp subjects, a total of 12 issues are now planned for release in the next few weeks. A meeting of the Indian Government's Philatelic Advisory Committee was held on 28th November, to discuss and recommend new stamp subjects for 2017, but no information has been shared with the public. We urge India Post to put out the meeting minutes or the Stamp Issue Plan for 2017 with utmost urgency. This process should not remain shrouded in secrecy, since stamp collectors can plan better and help spread word for India Post's new stamp issues, leading to even better stamp sales. Update (26 Nov 2016): Another stamp subject scheduled, and postponed again. The Exotic Birds stamps were supposed to be released on 25th November, but will now be issued on 05th December. The set will apparently be issued as two miniature sheets and two sheetlets. The stamps are of Rs 5 (2), Rs 10 (2) and Rs 15 (2) denomination, totaling to Rs 60 for the set of 6 designs. India Post also shows that the stamp on Acharya Vimal Sagar will be released in November, but the date is neither known or confirmed. Another stamp issue, on Pramukh Swami Maharaj and Akshardham Temple has also been approved for release in December 2016. Could this be released on 07th December, his birth anniversary? This stamp will be similar to the one on Dr. APJ Abdul Kalam, first birth anniversary after their passing. Pramukh Swami Maharaj passed away on 13th August 2016. Surprisingly, the stamp on Hardayal Public Library doesn't appear on the new list of pending issues from India Post. We are unsure what to make of this change. Anway, see the list of pending stamp subjects for the remainder of the year below. Update (22 Nov 2016): India Post has finally started to reveal information on stamp issues for the remainder of 2016. In yet another ambiguous Facebook page (there are so many pages that India Post runs on Facebook, its not easy to find accurate information), approved releases for November and December were posted. - A new set of 6 stamps on 'Exotic Birds' will be issued on 25th November. Given the ample diversity of flora and fauna within India, issuing stamps on exotic birds is completed uncalled for and makes no sense. Continuing the newly initiated Birds series should have been the logical next step. - Stamps on King Vikramaditya and author Dhumketu appear to be included in this year's releases and not in 2017. BetterPhilately had first reported about these two issues last week, with an understanding that some of the recently approved stamp subjects would be issued next year. 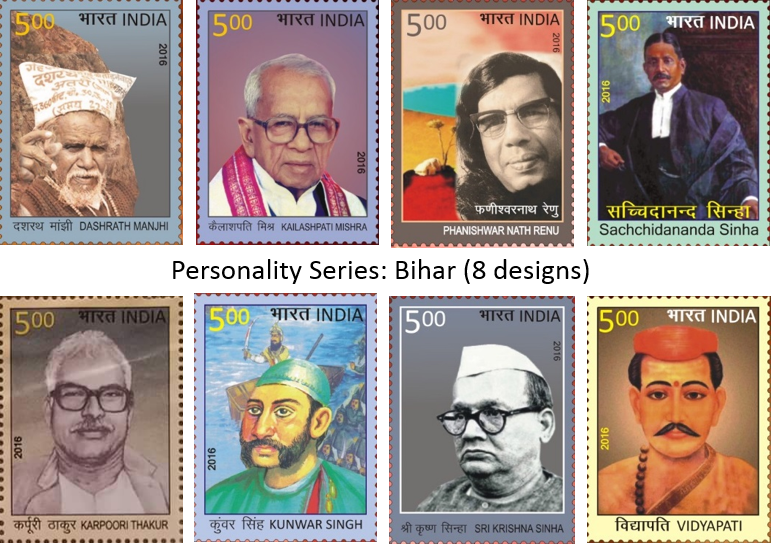 - The set of 6 stamps 'Pride of Bihar', commemorating personalities will likely see the light of day, next month. - A customized MyStamp was released by the President of India on 20th November to celebrate 15 years of Indian School of Business at an event in Mohali. Update (19 Nov 2016): November has had three stamp issues along with some other updates on MyStamps thus far. The three commemorative/special stamps were, 50th Anniversary of Haryana, Children's Day and Third Battalion The Garhwal Rifles. The stamp design on Haryana used Haryana government's logo for celebrating it's golden jubilee and laid it against an orange and green color gradient. The overall design was acceptable, but not being an original design it can easily be counted among the numerous other bad designs by India Post this year. On the other hand Children's Day stamps (2 designs) along with a miniature sheet carried paintings by children on 'Picnic' theme. Continuing the trend with high denomination stamps, both the Children's Day stamps were priced at Rs 15 each. There has been some discomfort among stamp collectors with somewhat increased cost of philately, but given the increase of costs of many other commodities and services over the 2004-2014 decade and considering postal rates globally, BetterPhilately does not oppose slight increase in minimum rates of postage stamps either. A joint issue has been planned between Papua New Guinea and India since late last year, but unreleased until now. The stamps were planned for issuance on 30 Sep 2016, then delayed to late October with a recent release date of 22 November, but is postponed again. BetterPhilately was able to share artwork for the PNG Post stamp sheetlet and can be found in another blog post. Information from India Post is still awaited. Information for four MyStamps also became available over the last few weeks. Personalized MyStamps were released on Charminar (likely put for sale in Hyderbad in August/September 2016) and Life Insurance Corporation of India (October 2016) and Customized MyStamps were released on ECGC and State Bank of Mysore. Life Insurance Corp and ECGC MyStamps are available for purchase on ePostOffice, but the other two are not. Older MyStamps on International Fleet Review, Montfort Brothers and Avila Convent were also put for sale on ePostOffice for Rs 500 per sheetlet. In other news, the stamp on AIIMS, New Delhi was postponed for a later date, likely 03rd December, during the graduation ceremony (convocation). Quite a few other stamp issues are pending and there is no clarity on their fate. Listed below are potential releases for the remainder of the year, some issues with ambiguity and others that are likely to be released next year and will be moved over to the blog post for 2017 stamp subjects. Let us know if there is other information available to share with the readers. Update (24 Oct 2016): Another stamp issue has been scheduled for release in November. A stamp on 50 Years of Haryana will be released on 01 November 2016. This will be the second stamp to be released to celebrate this North Indian state. India Post had released a stamp on 20 December 1992 to commemorate Haryana's silver jubilee. This appears to be the only state in India that has two stamps to its name. The Prime Minister of India is likely to release this stamp. The stamp on Varanasi City was released by the Prime Minister of India on 24 Oct 2016 during his visit to the holy city. The stamp design is the similar to three other stamps released on the city in 1983 and 2016 (2 MyStamps). Update (20 Oct 2016): It appears that there will be two additional stamp releases in October; Varanasi City (24 Oct) and National Day of Unity (31 Oct). Two MyStamps were released on Ghats of Varanasi earlier this year. Varanasi is represented by the Prime Minister of India in the Indian Parliament and this could be a direct results of increased focus on this ancient city. National Day of Unity is celebrated since the new government came to power in India in 2014, to celebrate the birth anniversary of Sardar Vallabhbhi Patel. Sardar Patel was instrumental in getting hundreds of small kingdoms to become part of the independent India and thus unifying the country as a federal republic. Another stamp issue to celebrate the centenary of Lala Hardayal Public Library, Delhi will likely be released in Nov-Dec 2016. Update (17 Oct 2016): Along with the Central Water and Power Research Station and Induction of C-130 stamps, a set of 4 stamps were released on Birds recently. It appears that this will be part of a series of stamps, given that this was first in a series that included Near Threatened bird species of India. The stamps were released in a set of 5 sheetlets and a miniature sheet. No full sheets were released for this stamp issue. It is believed that the sheetlets will be made available at face value at all philatelic bureaus, but ePostOffice is selling a pack for Rs 2300 (face value of stamps ~Rs 1200). Availability of sheetlets at face value is a great change from the last few stamp issues with sheetlets. Kudos to India Post. Two things that stand out in this stamp series. First, the design of the stamps is quite poor. This year has had so many mediocre stamp designs that it doesn't seem any different. India Post seriously needs to consider bringing back Kamleshwar Singh and Sankha Samanta to design new stamps. It is especially concerning because the rest of the stamps in this series could similarly lack good design. The second issue is the denomination of the stamps. It is highly recommended that small denomination stamps be more frequently issued that the Rs 15 and Rs 25 stamps. So far, 17 stamps of Rs 25 denomination had already been issued this year and now another one. It is understood that stamp collection is a hobby for 'kings', but keeping collectors budget in consideration will go a long way in promoting philately. Anyways, as always, confirmed release date for no other stamps are known at this point for the remainder of 2016. Let's wait and see what comes next. India-Portugal: Joint Issue (Dandiya Raas & Pauliteros de Miranda) - This will soon be moved to a new blog post for 2017 stamp subjects. Update (02 Oct 2016): Two stamps to commemorate the 2nd anniversary of Swachh Bharat were released on 02nd October. A miniature sheet in Rs 30 denomination was also issued. Stamp designs were crowdsourced in a competition conducted in July 2016. Three winners, two for the stamp designs and one for the miniature sheet were Binita Biswajeeta, Sanjula S. and Arushi Aggarwal. Binita Biswajeeta had also won an award in the Vibrant India Stamp design competition as well. 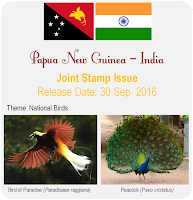 In other news, India-Papua New Guinea Joint stamp release was also postponed to late October 2016, likely 31st October. In all, September turned out be a damp squib. So many stamp issues were scheduled for release last month, but eventually none other than the Lady Hardinge Medical College were released. Let's see if the remainder of the stamps are issued in the last quarter of this year of will a majority of the subjects be pushed to next year. Update (25 Sep 2016): At this point we are unsure of stamp release dates for the remainder of September. Dendayal Upadhyaya stamp was likely postponed, so will be AIIMS and India-Portugal Joint Issue. There have been no notifications from India Post for these changes, but given that no release functions were held yesterday and Pandit Deendayal Upadhyaya's stamp was not sold through ePostOffice, it should be enough indication. That said, images of Deendayal Upadhayaya were seen on the internet. This stamp will be of Rs 10 denomination, likely a fitting stamp value for 100 years of birth of the stalwart. A new stamp to commemorate the centenary year of Lady Hardinge Medical College was released on 23 Sep in New Delhi. India Post has put out ads for Children's Day 2016 stamp design competition (Theme: Picnic) as well as potential release of stamps with fragrance. There are a couple issues with the Children's Day design competition. One, isn't it too late to ask for submissions when stamps have to be release mid-November? Second, why is the competition open to all Indian citizens? Shouldn't this be exclusively for 'children'? With regards to the stamps with fragrance, it will be prudent if subjects of Indian origin or indigenous foods are selected. Let's wait and watch what's in store. In other news, India Post is also inviting suggestions for stamp subjects for the next two years. Two issues again. One, there is no email or an easy way to send suggestions. One can likely comment on the Google+ page or their Twitter feed. Second, suggestions were invited from stamp collectors earlier as well, but nothing came to fuition. This is the third time in the last 10 years when such an attempt is being made. Good luck to all involved. BetterPhilately contains a lengthy blog post with suggestions. Do read. Update (17 Sep 2016): Two new customized MyStamp sheetlets have been put up for sale on India Post's ePostOffice - one for 25 years of Mphasis and the second one on Centenary celebrations of Karur Vysya Bank. Mphasis is an IT-services company based in Bengaluru and owned by the Blackstone Group. Mphasis MyStamp shows a logo of the company celebrating 25 years and map of the world in the background. Karur Vysya Bank is a private sector bank that was started in Karur, Tamil Nadu in 1916. The MyStamp sheetlet shows the headquarters of the bank. Both these MyStamps were printed under the scheme to issue customized MyStamps for corporate entities and educational institutions. Both the sheetlets are being sold for 500 Indian Rupees. Update (15 Sep 2016): Here's another update on stamp releases for the remainder of the year. It is possible that some of the subjects could be released in 2017 as well. See other posts for updates on other possible stamp issues. 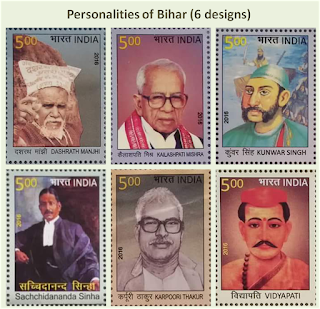 Update (07 Sep 2016): Images of the Personalities of Bihar stamp set have been seen on Twitter and Facebook. Thanks to our readers for confirming names of the personalities to be commemorated. We've done it again, predicting the correct stamp subjects for all six personalities. See the update from 3rd August below. Our continued effort is to provide accurate information to stamp collectors as soon possible. Here is an image of the stamps. Let us know if the release date or other information becomes available, we'd be happy to share. Do check BetterPhilately's twitter feed for other interesting news. Update (05 Sep 2016): BetterPhilately can now confirm the release of India-Papua New Guinea Joint Stamp issue to be 30 Sep 2016. India Post had recently indicated the release date as 31 Sep (obviously, a snafu). The two countries will celebrate their diplomatic relationship with a set of two stamps on the theme of National Birds. Papua New Guinea's Bird of Paradise and India's Peacock will be featured on the stamps. India had opened its embassy in Port Moresby in 1996 and Papua New Guinea opened its embassy in New Delhi in 2006, celebrating 20 and 10 years of each other's diplomatic presence, respectively. India's President had visited Papua New Guinea earlier this year and Papua New Guinea's leaders were in India in 2015 for the 2nd FIPIC Summit. Happy Collecting. Update (03 Sep 2016): India Post has put out dates for a few more stamp issues for the next couple months. BetterPhilately has kept its readers informed about most of these stamp subjects through various posts and its Twitter feed, but here is an update with some tentative release dates. Quite a few stamps were also released in August 2016 and those dates are listed below as well. Let us know if you have any questions or comments. Update (03 Aug 2016): This is a second update within the same day. BetterPhilately is sharing information on new stamp issues to it's readers. The following stamp subjects have been approved for release by India Post in 2016-17. Some of these stamp issues have been reported on this blog earlier as well. You've heard of these new issues first on this blog! Update (03 Aug 2016): It appears India Post could release quite a few stamps in August 2016. None of the release dates have been officially announced, but there are some clear indications for the ones listed below. There could be a set of stamps on personalities from Bihar. Such stamps were originally proposed by former Minister Ravi Shankar Prasad and are likely to be released together. Which personalities could it be? BetterPhilately believes it could be some among the following. Readers are welcome to drop a message with any other guesses. Update (01 Aug 2016): Two stamps and a miniature sheet were released on Tadoba-Andhari National Park to celebrate International Tiger Day in Nagpur on 29 Jul 2016. One of the stamps (maybe both) had a picture of tigress Maya hugging her cub. This image was taken by Amol R. Bais, a teacher and wildlife photographer from Chandrapur near Nagpur. This image was taken earlier this year and Maharashtra state's forest minister had worked with the federal government to get this stamp released. It appeared to be well coordinated and resulted in a stamp issue that will likely be enjoyed by stamp collectors. The next couple issues are somewhat certain. The first one likely will be a set of 4 stamps on Rio 2016 Olympics. It also appears that the 2nd issue on Orchids will be released soon as well. Looking forward to these upcoming issues. Update (16 Jul 2016): It's been a month since the last update, but here it is. First up, stamps on Yoga. Yoga. This was the second year straight when stamps were released on the theme of Yoga. Government of India is spending considerable effort to spread awareness about Yoga at a global level. A definitive stamp (25 paise denomination) was released with a generic Yoga pose. Then, on 20th June, a set of 12 stamps depicting the twelve poses of Surya Namaskar or Sun Salutation was released by the Prime Minister of India. A detailed review of this stamp issue can be found on another blog post. The main issue with the Surya Namaskar stamps was the unique distribution strategy for the sheetlet. The sheetlet comprising two sets of 12 stamps was only made available in the presentation pack that was almost sold through ePostOffice at twice the face value. Sheetlets were also printed in small quantities (25,000). It appears unlikely that this item will be cataloged by international stamp catalogs, especially Scott. This was all the action in June. It was also reported that UNPA will release stamps on International Day of Yoga in 2017. Yoga going beyond India's shores! But, is India going to share the cost of this issue or will it be a joint issue? In the first half of July, another MyStamp was released on SNDT Women's University Centenary. This as well as the MyStamp sheetlet on Amazon.in were made available for purchase on ePostOffice for Rupees 500 per sheetlet. Early in July, a massive number of news articles appeared on the internet about India Post allowing MyStamp printing for corporate or commercial entities. For 1.2 million Rupees (5000 MyStamp sheetlets), any company or organization can print a stamp in their name. This is to print the actual stamp itself, not the personalization image that is available for public use at Rupees 300 per sheetlet. Since February this year, there has been new MyStamps released each month so far and it would not be surprising to see more MyStamp sheetlets released this year. Could there be one for Bishop Cottons Boys' School, Bengaluru? The only other major stamp in July so far was the stamp release on BSE or Bombay Stock Exchange Ltd. This issue was destined for release this year, but has been pending since 2001 when it celebrated its 125 years of existence. This year, 15 years later BSE is 140 years old and India's Finance Minister was present at the release ceremony in New Delhi! Stamp design has not been at it's best this year and it is really important that India Post brings back Kamleshwar Singh and Sankha Samanta to design new stamps. In other news, Better Philately informed our readers and twitter followers that the India-Portugal Joint Issue will be released on 26 Sep 2016. A set of two stamps will depict folk dances from both the countries, specifically, stick dances from India and Portugal. India's Dandiya Raas from Gujarat and Pauliteros de Miranda from Portugal will be depicted on the stamps. It is likely that a souvenir sheet will also be released along with the individual stamps. Although India Post has not yet provided any information for upcoming stamp releases, but could stamps be released on the following? Update (11 June 2016): Another month has gone by without the stamp issue program for 2016 being released by India Post. Philately in India is just chugging along with new MyStamp releases every few weeks. India Post in the last year or so, has certainly figured out a way to reach philatelists pockets. Releasing so many MyStamp sheetlets will ensure that for a postage value of Rs. 60, India Post makes five times more money with each sheetlet costing at least Rs 300. After the benevolent act of releasing a MyStamp on Western Union, India Post co-opted Amazon India (e-commerce website) to 'honor' their third anniversary in India. 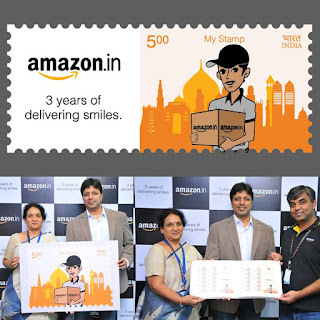 A MyStamp sheetlet on Amazon India was released on 03 June 2016. Clear images of the entire sheetlet are still to be seen, but see the stamp image below. Three other MyStamps, commemorating India armed forces were released on ePostOffice on 09 June 2016. One sheetlet each for Indian Army, Indian Air Force and Indian Navy, likely in co-ordination with Army Postal Service are available for purchase on ePostOffice. Another postage stamp with a direct commercial impact was released on 100 years of Tata Power, a privately owned electric utility company. Last few years have seen a certain increase in stamp releases for industrial ventures or private companies. This needs further analysis. 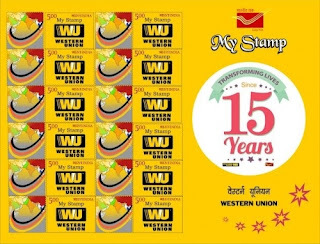 Update (11 May 2016): The MyStamp sheetlet on Western Union was released on 10 May 2016. The unique feature of this MyStamp is that there is no vernacular Devanagiri translation on the stamp itself. Western Union is only printed in English. It had been a long time since only English was used on Indian postage stamps. 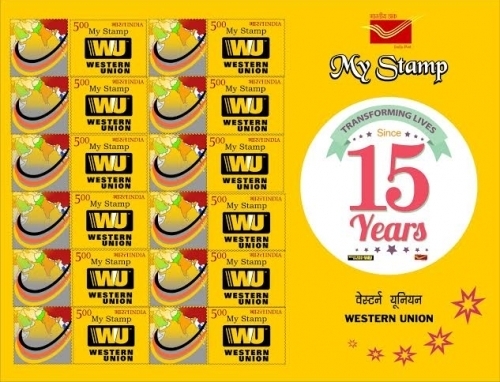 The stamp itself is poorly designed with just the Western Union logo. One could have easily depicted electronic money transfer happening via computers and satellites, from cities to villages etc. Anyway, here's a picture of the sheetlet. New MyStamps are being released at a rapid rate and is hard to keep up with the collection of these personalized stamps. Fortunately ePostOffice is selling these stamps and it will help collectors. Tata Power completed its centenary year in February 2016 and the stamp is likely to commemorate this feat. It appears that on the second International Day of Yoga on 21 June, stamps showing Surya Namaskar will be released. Surya Namaskar or Sun Salutation comprises of 12 poses. Will there be multiple stamps showing each position? The Bombay Stock Exchange stamp on the other hand, was long due. It was originally proposed for release in 2001 to commemorate 125 years, but better late than never. O. P. Jindal stamp release was postponed and the new date is yet to be announced. Three other MyStamps were released as well. Two customized MyStamp sheetlets on Avila Convent School, Coimbatore and Hindustan Aeronautics Limited were released. Another MyStamp sheetlet was released on Allahabad High Court in parallel with the commemorative stamps. MyStamp sheetlets on tourist places from 2014 and 2016 are now available for sale on ePostOffice as well. This was awaited by many collectors and is an appreciable step by India Post. It is puzzling that 5 out of 10 singers already have a stamp in their names, but are being issued for a second time. What a waste of talent and ideas! There are scores of other singers that could have been easily included in this stamp set. Will provide another update soon on this issue. It's raining MyStamps. Three new MyStamps were apparently released on 29 Feb viz. Gateway of India, Mahabodhi Temple and Sun Temple (Konark). These personalized stamp sheetlets along with the four others issued in 2016 have been printed at SPP, Hyderabad. All MyStamp sheetlets printed until the end of 2015 were printed at ISP, Nashik. Is this the end of the road for stamp printing at Nashik? One wonders why can't Indian stamps be printed at CSP, Kanpur and ESP, Chennai, both privately owned printers that were doing a great job until 2004-05, since when SPP and ISP presses have been printing all Indian postage stamps. There have been enough stamp releases and additional information available from India Post now. This post will be used for new updates, while a new post will cover the released stamps (beginning with Jan-Mar 2016 issues). Two other stamps have been included for release in March 2016. Another stamp issue scheduled for release this week. It will celebrate the birth centenary celebration of a well known industrialist and philanthropist (Dempo Group). The Dempo Group also owns The Dempo Football Club and The Navhind Times. Four more new MyStamps were released at the Delhi State Level Philatelic Exhibition - Utsav 2016. It's raining MyStamps, but not surprising given this was a decision made at the last PAC meeting in July 2015. It was decided to have MyStamps and picture postcards for tourist places all over the country and this appears to be in line. That said, it is extremely painful to collect these stamps, given their limited availability. It would be prudent for India Post to sell all MyStamps on the ePostOffice platform. A new MyStamp was released along with the commemorative stamp on the day of the International Fleet Review in Vishakhapatnam. There wasn't any notification or no signs of this stamp being made available to stamp collectors. It is strongly recommended that India Post put up this MyStamp for sale in philatelic bureaus or on ePostOffice. India stamp collections are unlikely to be completed without including MyStamps, which appear to have their own design and denominations. Update (16 January 2016): Adding a few upcoming stamp releases. Once a few more stamp releases are announced and put out for stamp collectors, the tabular format with added information will be put up. Two of these confirmed issued were correctly predicted earlier in this blog post. Update: A stamp design competition was recently announced by India Post. Stamp designs on the theme 'Vibrant India' are being accepted until 30 November. Selected designs are expected to be released as stamps during the 2016 Republic Day celebrations in January. Sourcing stamp designs from the public appears to be a welcome change. Historically, just Children's Day stamps were designed by school kids and opportunities for others to design stamps were rare. India Post (Minister Prasad) had made known the intent to crowd source stamp designs for Independence Days and Republic Days on various social themes. In 2015, Swachh Bharat (Clean India) and Women Empowerment stamps were selected based on designs submitted by the public. Although the Swachh Bharat stamps were meant for release on Republic Day and the Women Empowerment stamps for Independence Day, both the issues were slightly delayed in their release. It be better to keep the competition open for a longer duration to ensure maximum participation. Nevertheless, these efforts deserve applause. Just putting out some ideas for stamp releases next year. India Post has not announced a plan for stamp releases yet, but a stamp release for International Naval Fleet Review is most likely in Feb 2016. This list will hopefully get some more details added and then eventually morph into the final plan for the year with additional details as stamps get released. India-Papua New Guinea joint issue sounds interesting. So do Ramayana and Mahabharata but when will ever stamps on costumes, Indian food, etc. release? All countries have stamps series on their costumes, gastronomy, etc. But India no. You wrote above: "It had been a long time since only English was used on Indian postage stamps." I am curious. Can you provide some examples of Indian stamps where only English was used? Are there any post-independence stamps? Pls. let me know. Here are some examples: 1949 UPU stamps, 1953 Railway Centenary, 1960 Thiruvalluvar, UNICEF and Subramania Bharati. There are quite a few more stamps that only had the denominations printed in Devanagiri as well. Hope this helps. Any idea on the birds issue? I have heard it's a big issue with 10-20 stamps? Ramayan- Mahabharata issue to be a huge set of 95 stamps!! When are personalities of Bihar slated to release? Or are they heading for a similar fate just like the Legendary singers of India? I have also come to know that Ramayan & Mahabharat are going to be issued in a big set of 100 stamps. They'll be similar to the 100 years of Indian cinema where only m/s and s/s will be issued. No individual stamps. Birds of India is going to be another such similar issue with 20-25 stamps slated to be a part of the issue. Thanks for sharing this information with our readers. It is much appreciated. Another big set in the offering is going to be means of transport through the ages. A set of 15 stamps!! Thanks for sharing this information with our readers. It is much appreciated. This stamp subject was likely first intended to be released in 2013. Let's see if India Post can release some of these pending issues. Take a look at our blog for other stamp issues that are pending and see if there is additional information you'd like to provide with any confirmed information. Thanks again. Read somewhere, 2016 is 50th Anniversary Year of establishment of diplomatic relations between India and Botswana. It would be great to have a joint issue to honor the same. High hopes my friend high hopes!! Regarding the stamps on Season's Greetings, have commemorative stamps also been issued along with the miniature sheets? Also, I feel the stamps are too high priced for use on mail. Rs. 5/- and Rs. 15/- would have been preferred instead of Rs. 10/- and 20/-. This has been a matter of concern for stamp collectors on some other online platforms as well. India Post needs to consider the current mailing rates while deciding stamp denominations. At BetterPhilately, we agree that the denominations for these Season's Greetings stamps should have been the current mailing rates, Rs 5 and Rs 15 or Rs 25. These stamps have been issued in a miniature sheet of Rs 30 denomination as well. Thanks for the feedback. Is it possible for you to put out the complete list of stamps including miniatures and sheetlets issued by India Post in 2016 alongwith their denominations.